TERGO® UMS-TF/UHD-TF/UHX-TF Reach truck with telescopic forks. Specially designed to work in double deep applications, UniCarriers new generation heavy-duty reach trucks are also available with telescopic forks. 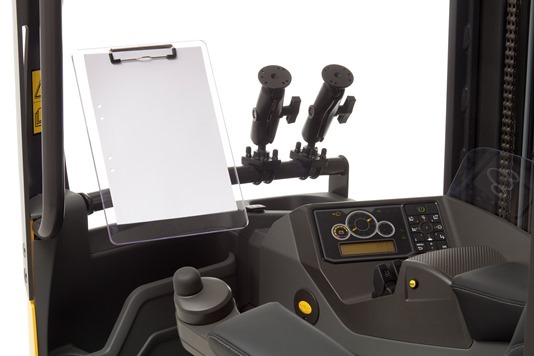 This is stability, performance and ergonomics without compromise – for your warehousing productivity. Compared with conventional storage, the TERGO® reach trucks with telescopic forks require approximately 25% less space for the same storage volume. With special hydraulic fork extensions it is possible to reach two pallets deep from one single aisle. The UMS–TF is the perfect versatile partner in most operations for lift heights up to 8.950 metres. For even tougher tasks, there's the robust UHD–TF that handles loads up 11.500 metres. A combination of sensitive controls, the extremely stable mast and chassis add to superior control when lifting and stacking. Angled overhead bars, tilting seat and tilting ProVision mast design with integrated hydraulics, further enhance very good vision for safe and fast material handling. For the highest warehose applications, choose the steady UHX-TF with lift heights up to 12.100 metres. Ergonomics are absolutely world-class. UniCarriers unique mini steering wheel with floating armrest, the multi-adaptable operator's environment, intuitive controls, spacious cabin and hands-free directional control put the operator in control to maximise efficiency and safety. A wide range of extra equipment such as ASR – Active Spin Reduction, LAS – Level Assistance System, Ergologic operator interface, Fast Track battery change system, load wheel brakes, video camera and cold store cabin complement what are probably the world's most personal reach trucks. Are you interested in the UniCarriers UMS-TF/UHD-TF/UHX-TF?